Here is an interesting design. This vehicle is called Tripod. It is made and sold by The Columbia Cycle Works http://columbiacycleworks.com/index.php? option=com_content&view=frontpage&Itemid=2 located in Portland, Oregon. Colombia Cycle Works appears to have focused their design for a velomobile solely on keeping the occupant out of the elements. It features a fully enclosed cockpit with windows all around. Visibility should not be a factor at all. And at a price of $4300 US, it is hard to overlook this as a possibility. Particularly when, as the website states, it comes with an electric assist motor. There would almost certainly still be some aerodynamic benefit, although not nearly as much as in something like a Trisled or Quest. But then it is certainly a heck of a lot cheaper too. Nice video about the history of alternatives to the standard bike. Found a website full of wonderful information a while back. For those of us who want to build our own bikes http://www.recumbents.com/wisil/whatsup.htm is a wonderful resource of information for anyone who wants to try building a bike, fairing or even a streamliner. Lots of great science, engineering and practical advice to people looking for information on designs and such. Check it out and search it. It has more information than most of us will need for our builds. 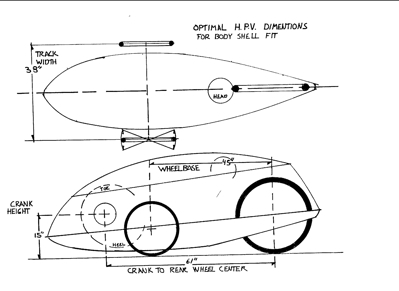 For those of you who would like a velomobile but like me do not have thousands to spend on one, I will be starting a new project velomobile I am building from scratch. I will attempt to go step by step for those of us who have no past skills welding or making fiberglass composite shells. I will also be starting a show on youtube in the near future. Stay tuned for further updates. The Team velomobile is available for $8250 Canadian. It was is produced in North America and uses the tried and true Cab Bike design. 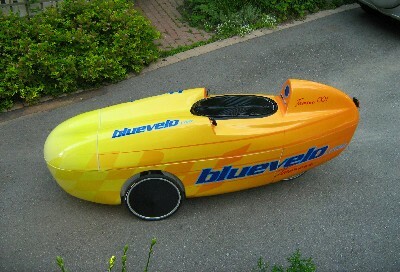 Very streamlined and excellent on price, this velomobile is an excellent velo for the money. Definitely something you should check out. Look to http://www.bluevelo.com/page2.html for more information. O.K. without a doubt my favorite manufacturer is our Australian friends at Trisled. They have 4 racing velomobiles and 2 road going velomobiles to choose from. 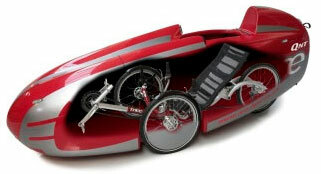 They also have 2 more regular, tadpole, recumbent trikes. They can be located at http://www.trisled.com.au/index.asp. The velomobile to the left and at the top of the page is called the Avatar. This has the benefit of super streamlining in the design. It should be the fastest of any road going velomobile, but it is hard to tell without actually being in one. This one lists for just under 15,000 dollars Australian. This one is the Formula Trisled. It starts at AU $3700 and goes up to AU $4200 including the fairing shown here. This is the racing version of the Trisled velomobiles. They also list a fastback design, but do not show the fairing as seen below. Aquila. This is without a doubt my favorite designed velomobile of all time. To see why see the video at the bottom of this page. This design has vents for cooling, an opaque roof for shade and a fully enclosed cabin space. In the AIPP it is also without a doubt the fastest velo on the track. It lists for AU $ 8500. Although this beautiful design was intended for racing, I see no reason it couldn't be used on the street. Just add lights mirrors, and go! 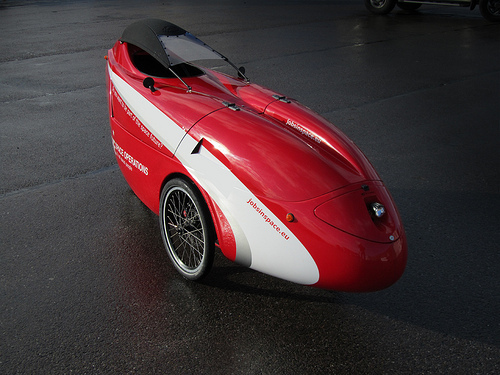 The Steintrikes Thunderstorm is the newer, lower version of the Leitra velomobile. It is designed to be lower, faster and more comfortable than the Leitra that it replaces. The fairing can be removed for riding if desired. The entire front canopy hinges forward for easy entry and exit. The site located at http://www.steintrikes.com/trike/thunderstorm.php can provide you with more information except the price. The Aerorider Sport available from http://www.aerorider.com/en/sunrider.html does not list a price, but one would have to imagine it is pretty high. It features a composite structure, hydraulic brakes, a cycle computer, a 48 volt electric assist, vents, battery monitors and lights. You need to contact them for the price though. They also have a concept version shown on their website. It appears to have a full enclosure with a windshield wiper and NACA ducts on the side. The Borealis velomobile from http://velomobiles.ca/Borealis.html is a body you can buy that fits over top of the Trice QNT tadpole recumbent trike or newer Sprint NT. The total cost of a shell with lights and made out of Kevlar looks to be just over 5000 dollar Canadian. If you already have one of these trikes you might check this out. It is a very nice design aerodynamically. The Flevobike Orca is available starting at 7500 Euros and is made with front drum and rear disk brakes. The large cover can be opened with a hinge. This is an update to the well known Versatile. The wheels on this model mount directly to the body, eliminating harsh road bumps passed through to the rider. This bike comes complete with lights, signals, horn buzzer, an ignition lock for the electrical system composite wheels a Rohloff speed hub and rear view mirrors. At this price point fully loaded with all the options, this may be the deal to beat. Check out http://www.flevobike.nl/en/products/orca for more details. 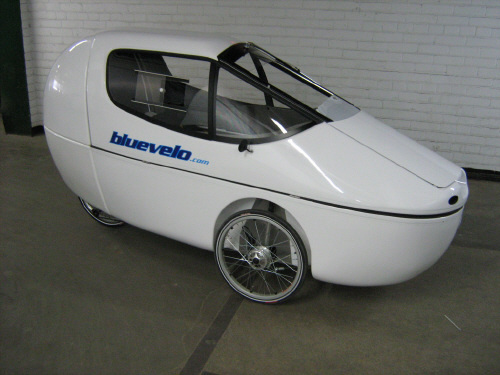 The Flevobike Alleweder has a distinctive double hump front end and is one of the cheaper velomobiles you will run across. At $4495 kit price or $6995 fully assembled, you can find this one at http://www.velomobileusa.com/. 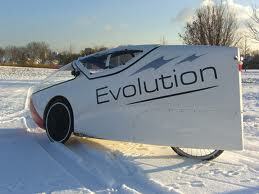 One thing you will notice is the fact that this may be the only velomobile made out of aluminum. It is produced in Midland, Texas here in the United States. 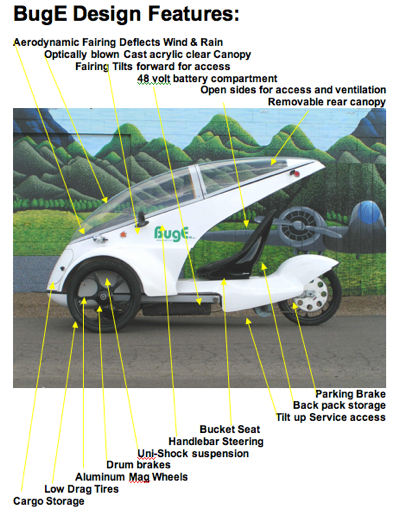 Blue Sky Designs are known for mainly selling the BUG E electric vehicle. They also sell bodywork so you can build your own velomobile using their fairing, canopy and bodywork. 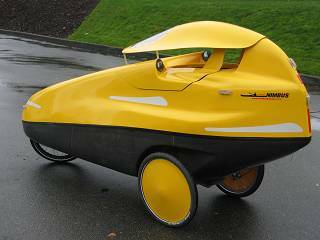 They will work with you with your design, but you need to use your own recumbent tadpole trike as a base for the bodywork. As of this writing, you can get the canopy and body work from them at http://www.blueskydsn.com/kit.html for a price of 1,000 dollars US for the bodywork and canopy. All you need is use a recumbent trike. Below are the dimensions of the trike. Below here is the BugE. It is not a velomobile but reverse trike using electric motors and moped running gear. It is registered as a motor vehicle and comes with paperwork to get it registered for street use. It is sold as a kit and must be assembled. 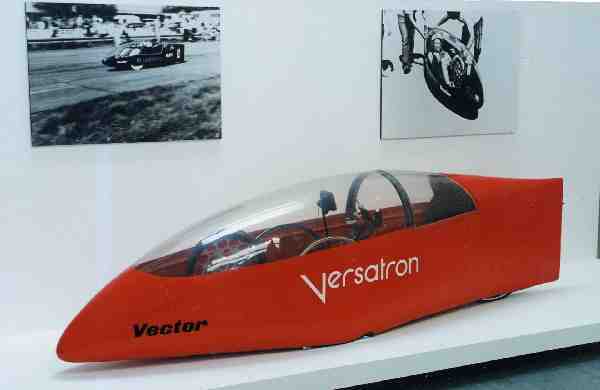 I won't go into to much detail about the first Go One velomobile. Lets just say that the Evolution is indeed an evolution in its design. The original did not have the sweeping tapered rear end this one has. The aerodynamic capabilities of the velomobile are best when the rear end tapers like an airplane wing. The first one did not do that. This one is indeed one of the best designs on the market. A simple design with a full enclosure. It is manufactured in Germany and can be shipped anywhere in the US. Check out http://www.go-one.us/models/go-one-evolution for more information. The price comes in at just under 13,000 dollars, but the hard top roof is a 2,000 dollar option. 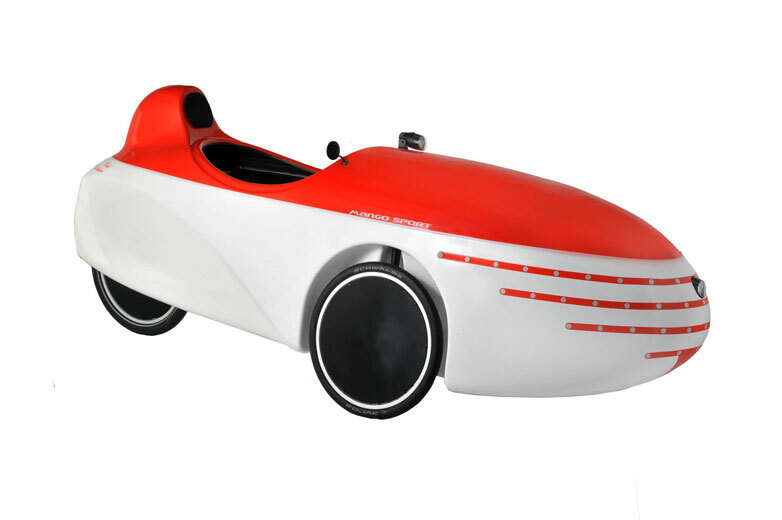 If I was buying this velomobile I would almost assuredly have to pay the extra two grand for the knowledge that my aerodynamics where at their most optimal. As with all velomobiles lighting and directional signals are optional, but this one even has an electrical ventilation system as an option too. Without a doubt the one I want and cannot buy is the Vector. Built back in the 1980's to compete in the IHPSC races, the Vector is easily the most streamlined and close to the ground. I believe the had 24 inch sew up tires in front and a 700c rear wheel. It had a lexan canopy and was constructed with 2 inch tubing. Apparently the huge clear canopy caused a few problems. It would cook you on warm days and fog up on cool days. If you want to know about something really close in design stay tuned, I will be uploading a velomobile in the near future that could be a production version of this. It probably isn't, but it definitely has some of the same design cues. Check out the link below for some more information on the Vector. The Sinner Mango is brought to you by the people at www.sinnerbikes.com. Pricing as seen from the people at http://www.go-one.us/models/mango/parts-accessories is as follows. The Sinner Mango Plus is listed at $10,884, the Sinner Mango Sport is $11,620 and the Sinner Mango Red Edition is $13,764 all US dollars. They also list lots of optional equipment . As you can see the Sinner Mango is constructed of fiberglass and features a fully enclosed drive train as well as a full dash made of carbon fiber. 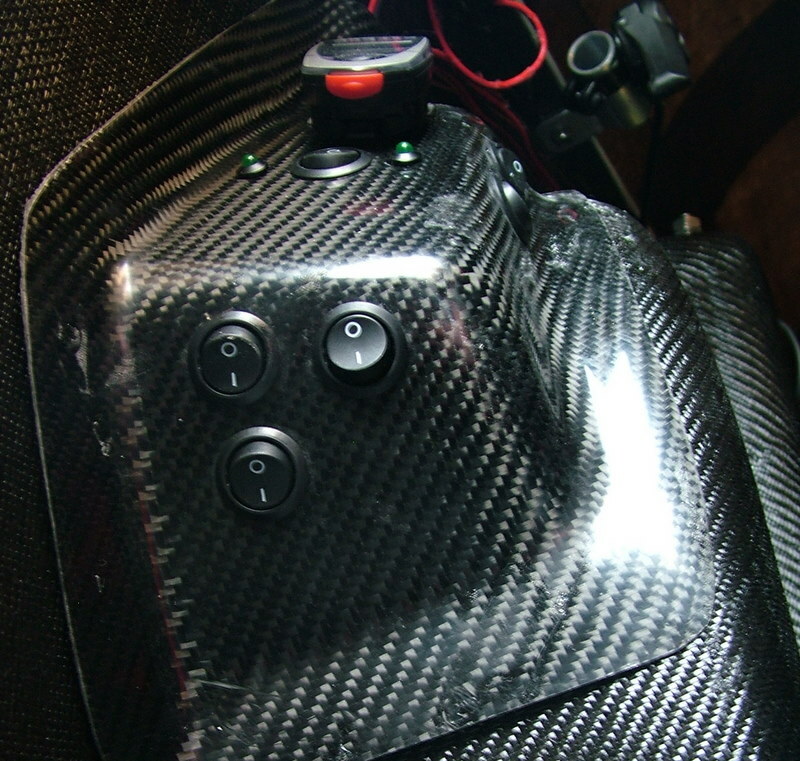 There is also a carbon fiber version of the Mango + available. Their are three models to choose from, the Mango Tour model seems to be the most promising. The Tour model has included items like a bell, a bike computer, battery charger, cover with foam cap, pump, spare tire and paste stuff. It is fully ready for a cross country trip if you like. Once again here is a random video from youtube. 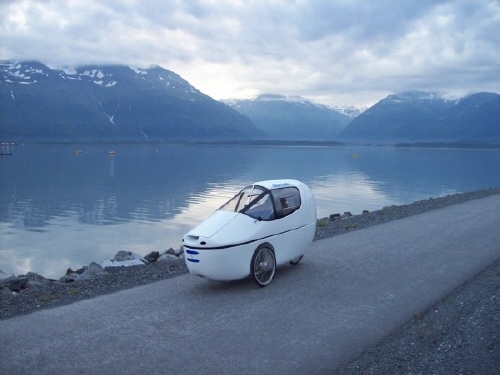 As you can see these velomobiles are some of the most popular. There is a large number of Sinner Mango videos I have found on youtube. Some of the videos are a half hour long or more. Obviously a velomobile is a much more comfortable bike to ride than a traditional bike all while requiring up to 50 percent less effort or more to pedal the same speed as an upright bike. The video on the right shows the speed capabilities of a Mango. This one reached 111 kph on a downhill ride. Update: had a fellow reader link me to some sites showing lots of wonderful pictures. 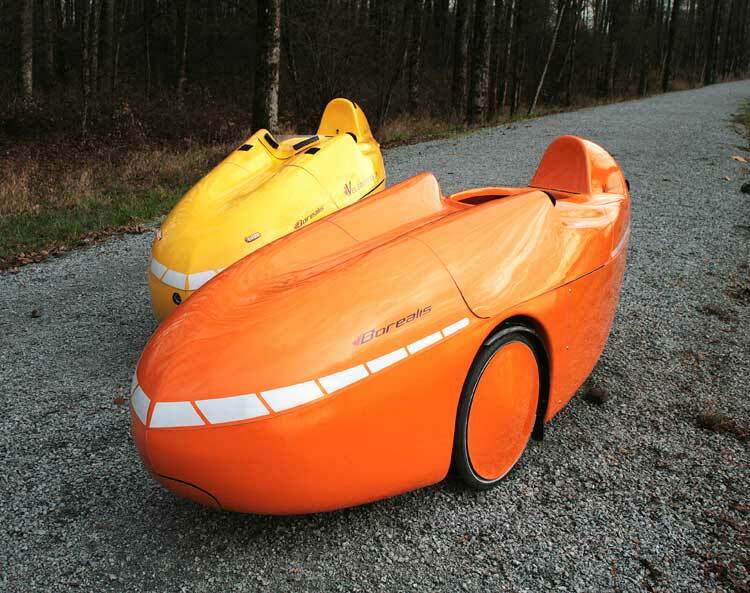 Here are a few from http://vulkanlandbiker.at/gallery/Mango-Velomobil-211-Velomobiel I won't upload many, the files are huge.